As many of you know, I have a brain tumor in the center of my head that doctors are unable to remove. Five years ago, I had a second brain surgery to remove it, only this time the neurosurgeon could only remove a little bit because the substance had changed to more stickiness and with the optic nerve and carotid arteries so close, there wasn’t much he could get out and still allow me to have some semblance of life. So I had to have Cyber Knife (a highly specialized form of radiation) to hopefully keep it from growing. Right when the doctor walked into the room, he said, “It actually looks like it’s gotten smaller (which Cyber Knife is not known for doing. 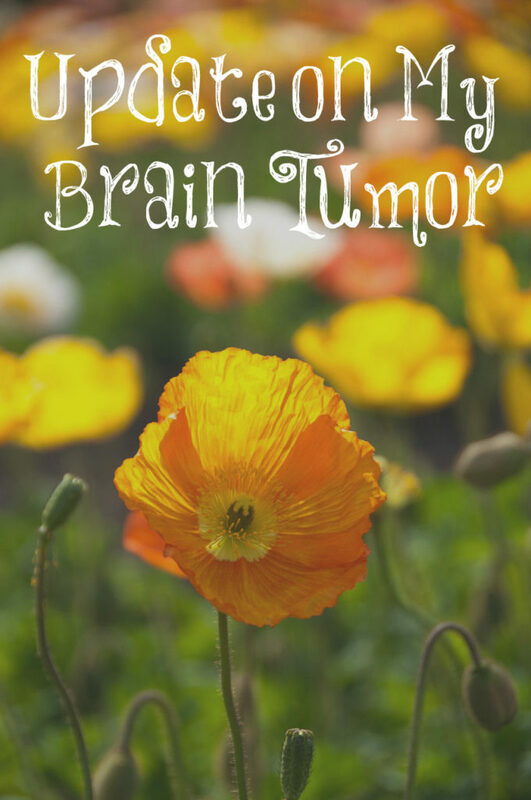 It just keeps it from growing and each MRI so far has shown that it’s gotten a bit smaller) and I don’t expect it to ever grow again!” He said I now only need MRIs every other year and if any part of it grows, he would do Gamma Knife on it which is just one shot of radiation. So I was VERY relieved and happy! Thank you to all of you who have prayed for me over the years. I very much appreciate it! The LORD’S lovingkindnesses indeed never cease, For His compassions never fail. They are new every morning: great is thy faithfulness. Your Legs or Your Life? With God all things are possible, you are truly blessed Lori. What wonderful news, Lori! Continued prayers for you, that you have many more years to enjoy your family and your ministry! Praise the Lord! Thank you for your faithful posts. I read them each day and am constantly encouraged to keep focusing on being a godly wife and mother. There are so many other voices out in culture that promote everything but enjoying our wonderful calling of serving our families so thank you for being bold and truly following Christ . I will probably never meet you until heaven but I am sure that I am just one of many that lifts you up to the Lord. Praise God!!! Thank you for sharing this!!! This is wonderful news! I think you are going to be around a long time to continue the work you are doing. You are doing so much good in a world where there is so much evil! I gain so much knowledge from reading your blog and Instagram. Continued health to you! You also have a wonderful husband to be so supportive of you! I cried bunches and through my tears I praised and thanked the Lord Jesus for this wonderful news. God is so good! I will continue to pray for you and your ministry. I look forward to all of your posts and I thank God for your boldness and willingness to obey God and teach the truth. You are such a blessing to me and to many others. Wow! Terrific news! God is so good! Thank you Lori (my VT2) for the update! Praising God with you and your family for the great report! I stand in awe how delicate and wonderful God has fashioned and formed our bodies -to know every detail belongs to Him! Thankful for His sovereign care over you! What a joy and peace He gives us through the pain and suffering! I am believing and hoping all things for this Ministry – that He who begun a great work in you will complete it until the day of Jesus Christ! You are in my prayers daily! Hi Lori, I am praising God with you and Ken! This is such wonderful new; our Heavenly Father does hear our prayers and He is so faithful!!! I praise the Lord along with you, Lori, for this great news! P.S. So sweet of Ken to fly home to be with you a few years ago when the tumor had previously grown back. That is one of the benefits of marriage you wrote about so well earlier this week. God bless you and your ministry! Oh Lori such good news! The Lord is so awesome! I will pray for continued shrinkage dear sister in the Lord! Thank you for your ministry! OH….and I have to add: I have a einkorn sourdough bread starter in the making right now!!! 🙂 So excited to try this bread out!!! So thankful to hear the good report and I’m so happy for you and your family. Thank you for sharing your life with us and for your encouraging posts on your blog! What great news Lori! I too read your blog daily although my children are young adults now, I can still relate to all that you teach and only wish I had known even half of what I know now from you. I’m sure your continued wellness is due in large part to your diligence with your diet (low sugar), and Dr. Marshall’s supplements. You might also like to take a look at the Knowthecause.com website by Doug Kaufmann. He’s had a show on TV for years proving that all cancers/tumors are in fact fungal sacks and if not fed with sugar and carbs they will not grow or even appear at all. God bless you and Ken. Joining in with all the sisters praising Jesus!! (All the way from Australia). Wonderful news, Lori!!! Blessings to you!! Thank you for ALL you do. Thank you, everyone! Your kind words and encouragement to me are truly appreciated. I’m rejoicing with you over God’s goodness and mercy, dear sweet friend. What a lovely answer to many prayers! I held my breath at the title of this post, Lori. What wonderful news it is, and a testimony to God’s faithfulness! You are so needed and so loved by so many!! (The tumor is actually shrinking, praise God!!) Much love to you … with continued prayers and support!